Traffic to pirate sites via regular desktop browsers is fading, new data suggests. A new report released by piracy research firm MUSO shows that traffic through mobile browsers is relatively stable. Whether piracy is down overall remains debatable, though, as streaming media players, which mostly fall outside the scope of the research, are still booming. While there haven’t been any breakthroughs in file-sharing technology in recent years, the piracy ecosystem is constantly evolving. Torrent sites have traditionally been very popular, but more recently direct download and streaming sites have offered serious competition. According to a new report published by piracy tracking outfit MUSO, browser traffic to streaming sites now makes up 60% of all traditional pirate site visits, leaving torrent sites and regular download portals far behind. In total there were 191 billion visits to pirate sites in 2016, roughly half a billion per day. While this is still a pretty significant number, the overall trend suggests that piracy is on the decline. When we compare the first six months of 2016 with the last half, there’s a drop of roughly six percent. The graph below shows that the downward trend is continuous and driven by visits from desktop browsers. 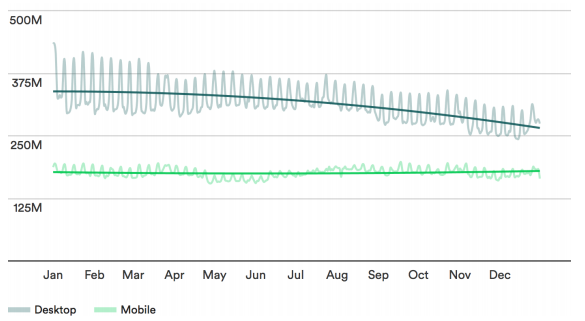 Mobile traffic remained relatively stable. Based on the above it is safe to conclude that pirates are moving away from the desktop experience which dominated historically. In part, this is because more people use mobile devices to access the Internet, but there is more. While MUSO’s data suggests that piracy is down overall, this might not be the case. As we have frequently covered, there has been a massive uptick in users of media streaming devices over the past year and a half. Kodi, in particular, has grown explosively and many people use these devices with “pirate” add-ons. Since these devices don’t use regular browsers or pirate sites, a lot of the “traffic” data probably isn’t included in MUSO’s dataset, which is provided by SimilarWeb. This is something to keep in mind. Overall, MUSO’s report does document some interesting trends. With a database of web traffic on over 200 million devices to 23,000 pirate sites, it’s the most comprehensive overview we’ve seen thus far. It will be interesting to see if desktop piracy continues to decline in future years, and if mobile traffic stays on the increase. For those wondering where all these pirates are coming from, relatively speaking Eastern Europe remains the hotbed for piracy. 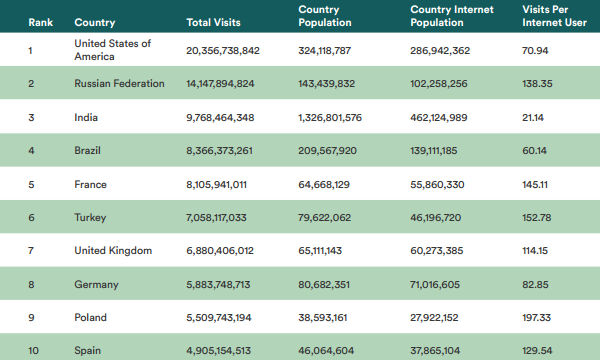 However, when looking at absolute traffic numbers, the US, Russia and India come out on top.